Anyway my 007 wasn't keeping as good time as it should, (probably as a result of some uneducated fiddling about perhaps... ) so I decided to replace the movement with a NH36. Winding and hacking sounds good for a grab and go. Now there are more things added to the list! No date dial perhaps for grab and go simplicity, and domed sapphire, and new chapter ring, and new bezel, and............oh dear! Anyway have ordered a few bits and bobs, wonder if it'll ever work again as a watch? Good stuff! I have a perfectly good 007 I'm thinking of modding... So will watch with interest! More as the parts arrive! As an aside, got this one working again today. Bought it to see if I liked a certain 'style' of watch. The stem broke off flush with the tube on the crown. Which was one of those 'oh dear' moments. It's only a cheapo Chinese movement but actually kept pretty good time! Anyway couldn't find the correct complete crown and stem. While looking for parts for the SKX stumbled across 'stem extenders'. Lot's of really fiddly 'engineering and mechanics' later and it's back in one piece and waiting for the thread lock to set. Keep us updated Ian, as it’s always good to see what others are doing. 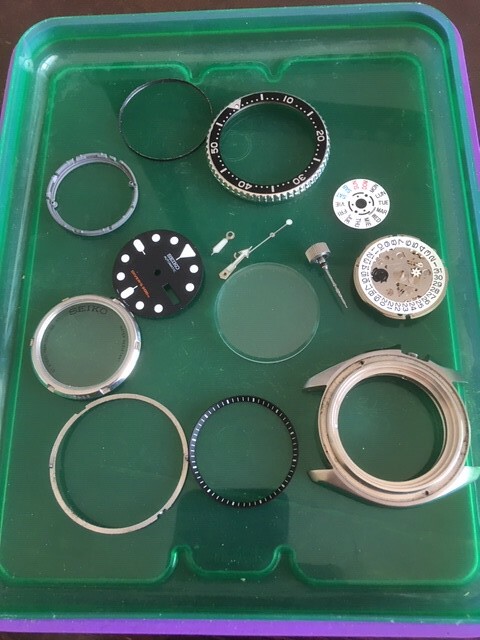 I get more satisfaction these days from breathing new life into old watches than buying new ones! 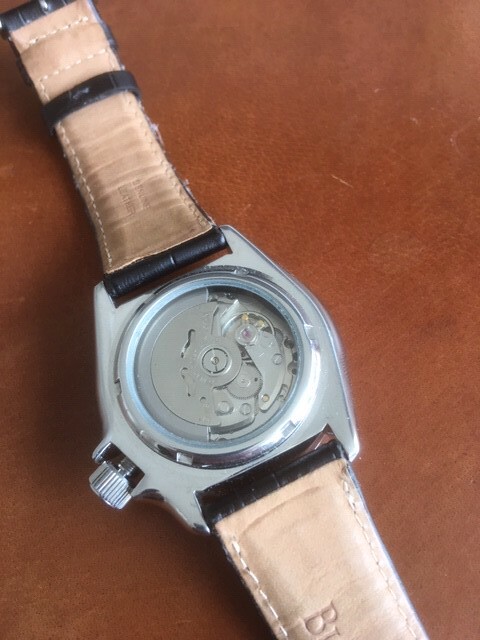 Hence I am currently wearing a Smith&Wesson beater with tritium tube hands (well, hour hand, as unfortunately the minute hand was missing the tube when I got it) that needed a new quartz movement. I replaced the mineral crystal with sapphire at the same time. I then upgraded the movement in a cheap MWC diver and - despite the reputation of MWC - it has actually turned out really well. 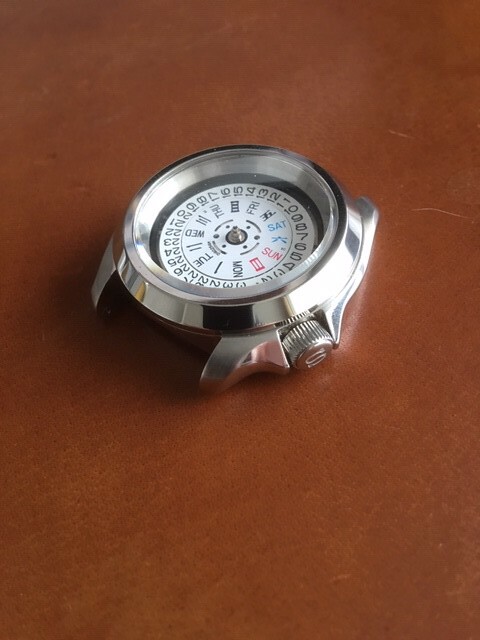 Then there’s a Seiko with a sterile Explorer dial that is just waiting on me sourcing a decent staking set in order to tighten the hands to go on a replacement NH36 movement. And finally I have two spare/repair G10’s on the way and have already ordered the replacement 955.112 movements and crystals. Can’t wait! 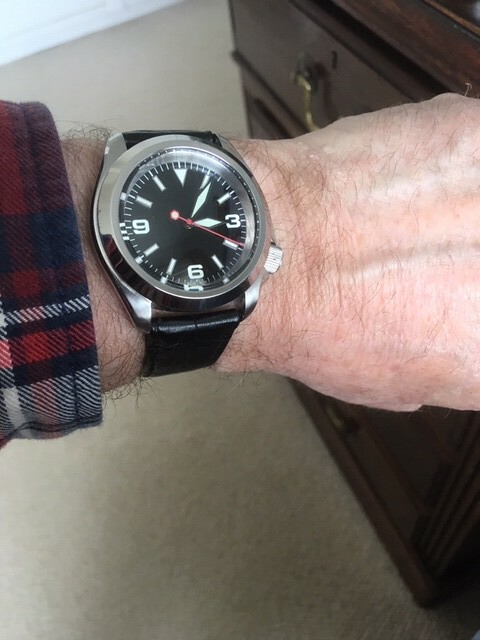 There is a disproportionate sense of fulfilment that comes from wearing a watch you’ve modded or resurrected. Sounds like some nice pieces. I know how you feel about repairing and making stuff. Trouble with me is, once I've made or repaired something I tend to lose interest in it, and start looking for the next project fix! Other than the G10’s I doubt anyone here would get terribly excited about any of them, but fettling watches (however amateur-ly) can be a lot of fun. I know what you mean about losing interest in projects. I have most of the kit for stickmaking, spoon-making, knife-making, leather-working, wood-turning etc, but just lack the time to become really proficient at any of them. And that’s before I list the “indoor” hobbies! Believe me, once you retire you'll have even less time! Or at least it seems that way. 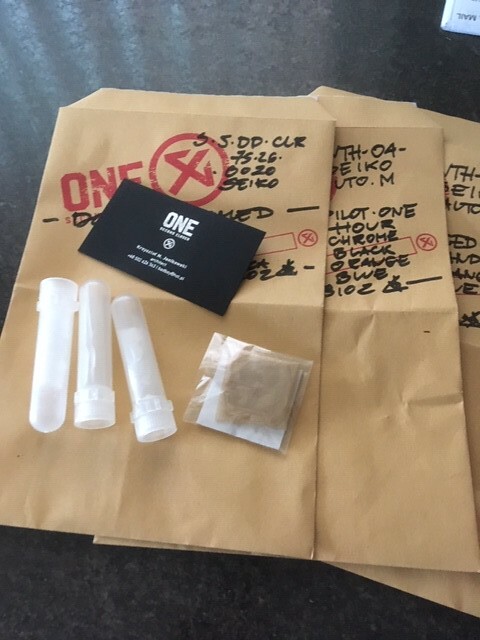 Just love getting packages in the post! Hands and domed sapphire with clear A/R arrived today. Just got to clean the case up and polish it, then when a few more packages arrive make a start. The watch on the right is going to receive a sterile Explorer dial and hands once they get here from Singapore. In the meantime I will replace the movement and drop in the sapphire crystal. Just as well Mrs Gunn was out when the postman called! EDIT: Now there's a bonus. I popped new 370's into both watches, just to check that they really were u/s, and after a couple of seconds one has sprung into life. 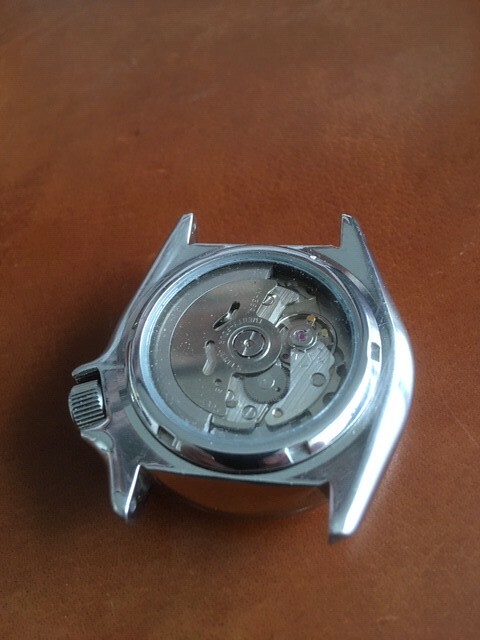 I will keep it on the wrist for 24 hours or so before deciding whether to replace the movement. It is perfectly synchronised with my existing G10 so I should be able to tell any gain/loss. Servicing is well beyond my capability! Fortunately the 955.112 is a common enough movement so I am sure that in time another dead beater will become a recipient for it. Last edited by willie_gunn; 2nd April 2019 at 13:57. Nice one. Looks like some fun there. I've got an Explorer-alike dial coming for this one too. Would be interested to know where you get your movements and crystals if that's ok? Started by giving the case a clean, then polished the sides to remove some hairlines, and redid the brushed style finish on the top surfaces with some 600grit wet and dry glued to a nail file. (which hasn't been missed yet). Then cleaned the case again. 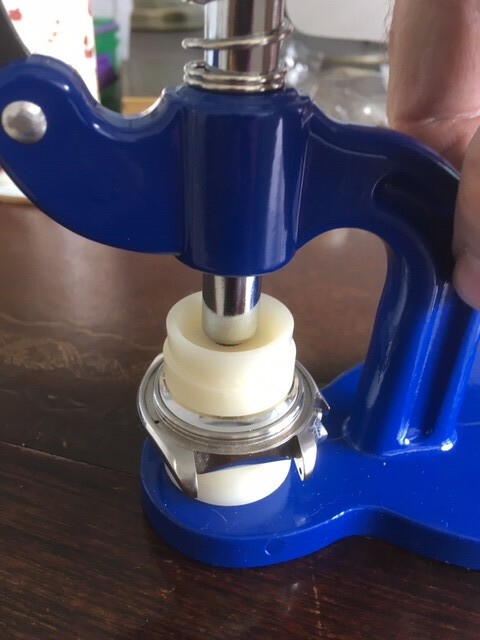 Pressing the Domed sapphire in with my new (cheap) press. 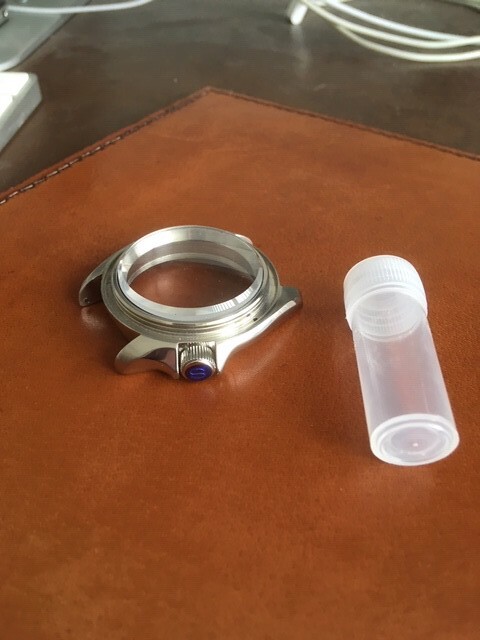 Case with Domed Sapphire and new polished chapter ring in place. Re-used the crystal seal as it's not going to see use underwater anymore and the old one is good enough for a dust seal I think. Hopefully it's seated far enough in! The movements and generic crystals are mostly from Cousins or Leosics, but if I'm after a redundant movement then often eBay or foreign websites will yield dividends. A couple of French FHF movements, for example, were easier sourced from France....Quelle surprise! SpeedTimerKollektion in the Netherlands has been very good for Seiko and Wenger watches and parts. For upgraded sapphire crystals for older Seikos I have used CrystalTimes, who have an excellent service. 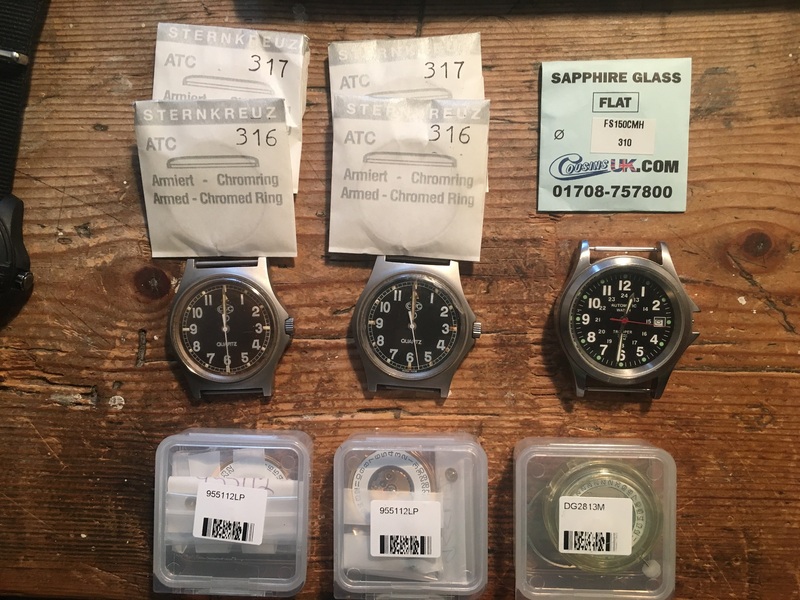 The dial and hands for the DG2813 are coming from an eBay seller called atn123 in China but I've also used raffles-time in Singapore who were very good. Thanks, much appreciated. All new to me so trying to learn about suppliers etc. so thanks for the info! Sadly the DG2813 didn't quite go as planned, as stupidly I broke the seconds pinion on the replacement movement when putting the hands back on. I am now trying to transfer the one from the original movement to the replacement movement, which has meant stripping down the rotor and the automatic bridge. Now I have the fun of trying to reassemble - and the gear train in particular seems determined to thwart me, with the third, fourth and escape wheels having minds of their own! 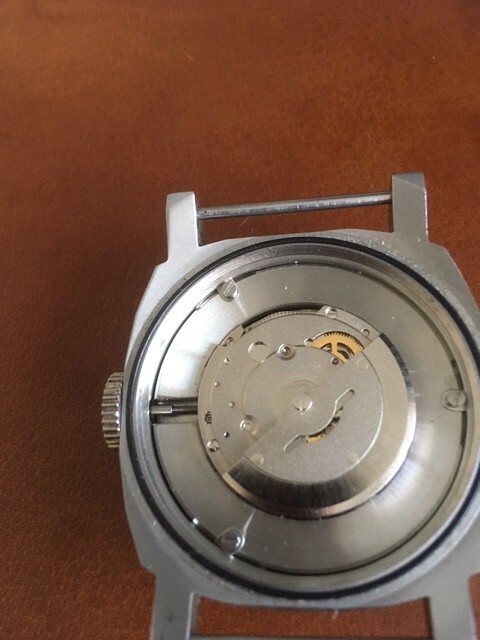 The more I do this the more I appreciate the skill of the professional watchmakers and repairers here. If it was me the movement would be heading for the bin I'm afraid! I have another movement on the way, on the basis my efforts to swap the seconds pinion might well come to naught! However I feel I ought to persevere as it is all a learning experience. It's starting to sound tempting. New S crown arrived so just a test fitting to check the threads and fitting. All good, so waiting on new dial now, and must order the new bezel. I have another G10 inbound, so with the spare movement and the new crystal I should hopefully be up to a quarter in a week or so’s time. The 2813 is still proving problematic - I am not convinced even sheer dogged persistence is going to win. That's good news then, apart from the 2813. Must be frustrating on that one. 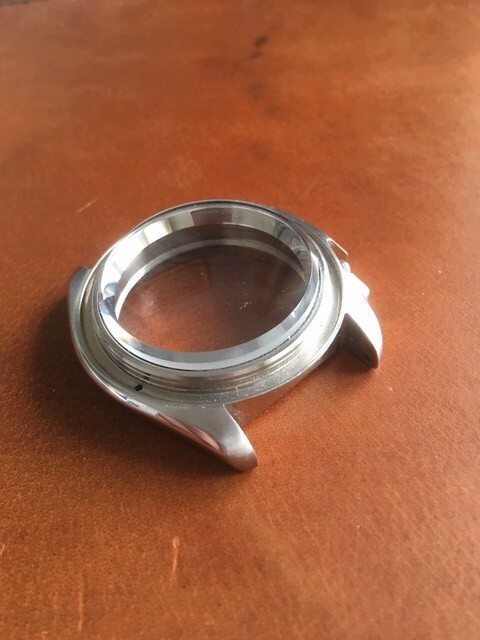 Waiting for the new dial, so will start on shortening the winding stem, and looking for a plain stainless bezel à la explorer. If you’ve not seen them already check a couple of users - “thewatchbureau” and “dr.seikostain” - on eBay. Well it's update time for the SKX. We were here last time with the new domed sapphire crystal fitted and the crown test fitted without the winder stem. Here I have the NH36 movement test fitted, with the black spacer ring from the 7s26 movement fitted instead of the grey one it comes supplied with. Simple to prise off and on, being careful not to damage the movement of course. Winder stem has been shortened and fitted to the crown, final fitment with thread lock. Not sure if thats the done thing but I like the idea of it being locked. Also the clear back test fitted (without gasket for time being). I don't think this was original on the SKX, although it was on it when I bought it s/h from sales corner. Anyway it had some model numbers and Seiko in black lettering which I removed with Solvol Autosol and finished off with Polywatch as I want it to be a 'sterile' watch when finished! And new stainless polished bezel arrived and fitted. Bought from thewatchbureau on fleabay, thanks to a heads up from willie_gunn, good value and looks a treat. Now just waiting for the new dial, hands already here and waiting. That is coming on nicely - I bet you can't wait for the dial to arrive! Glad to hear that thewatchbureau turned out okay. My fourth G10 is now ticking away nicely, though I don't have a photo of it with me here. The Sternkreuz 216 crystal turned out to be a loose fit, so just as well I had the spare 217 I originally ordered. The cheap Trooper beater that I bought with the DG2813 movement is ongoing. I have fitted the dial and a set of spare hour/minute hands. The seconds hand is proving to be a real challenge, with the 0.17 sizing a headache to fit. In the absence of that hand to check against, though, it appears to be keeping good time. I have worn it all week and it has turned out to be quite a nice "sleeper" that I could quite easily get used to. Of course neither watch is anything special, but the pleasure I get from working on them certainly is. Last edited by willie_gunn; 16th April 2019 at 17:05. Yes, thewatchbureau were excellent thanks for the heads up. It seemed to take ages for the dial to arrive, but had a small package from Singapore yesterday with the magic word Raffles on it! The beater looks good, nice work on the case as well by the looks of it. 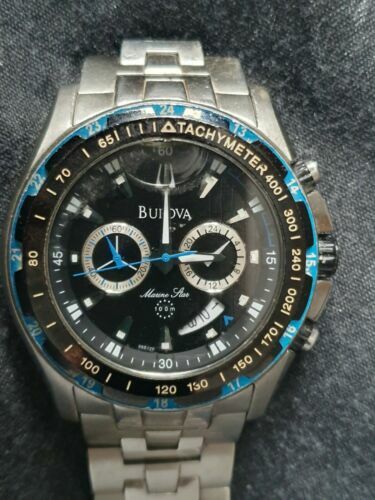 Also the Bulova looks really nice, hadn't seen one of those before. So with the arrival of the dial yesterday, it was time to put it all together. Fitting the dial, after removing the two unused pins, was pretty straightforward. Day and date wheels left on under the dial in case I want to change the dial later, although I doubt I will. Fitting the new hands was the hardest, most fiddly, annoyingly awkward job of the whole lot! Got there in the end with the help of the hands press I bought, well half of it anyway, as I found it easier to use the little plunger freehand instead of in the press. So here's some quick phone pics, I like the way it turned out. 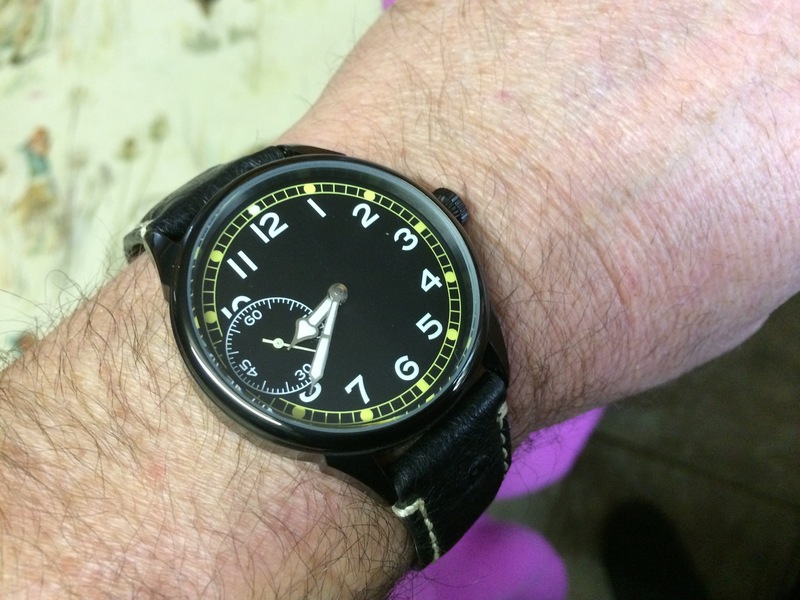 The no date sterile Exploreralike dial looks good and the hands seem to suit. It's on a crocalike Bulova stop atm but having seen williegunns watch on the nato one might e called for! All in all I'm really pleased with how it turned out, now it's got a hacking, winding movement and no day/date for grab and go duties! That has turned out well - you must be very pleased with a job well done. I also like the sterile explorer dial - instantly readable. The sword hands suit it too. It would be nice to see some photos of the watch on the wrist at some point. Hopefully by the time I get home the watch hand press and the new hands will have arrived. It gives me something to do over Easter, or at least until I head out again on Sunday evening. Yes very pleased so far. The Explorer dial looks great. Hope it goes well with the new hands. that's a beautiful dial, Kevin! what is the story behind that one and how did it come to be? 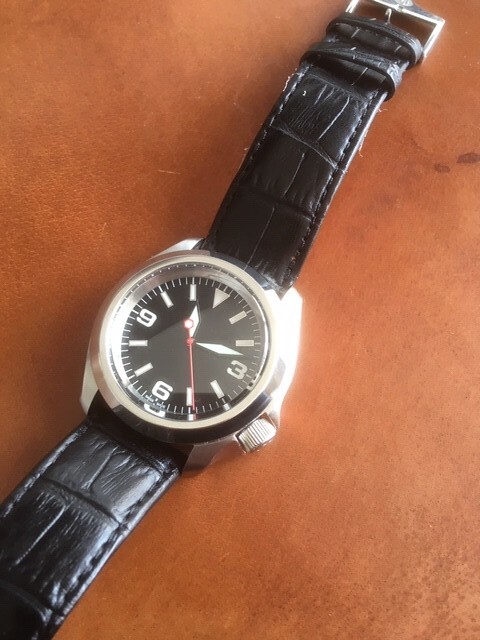 hi John,i built it because i didnt have a black mechanical watch and liked the simple but distinctive dial.i have owned flieger style watches but always sold them on after a while because they were not quite what i wanted..case is a display back sterile 42mm +crown in black PVD with supposedly a sapphire crystal.movement is an asian Unitas 6497 17 jewels hand winding.hand set is relumed cathederal style which came with the dial to which i added a lume dot at 12o'clock.all three major part sets came from different sellers but this watch gave me the least hassle on assembly so far..